I hope y’all (technical Texas term) had a great Thanksgiving. We did. We spent Wednesday stuffing family full of food! Friday…well…we spent Friday lazy-ing about the house, basically recovering from Thursday. Well, that and eating leftover turkey and ham sandwiches and pumpkin pie. BUT…we did head up to the Old Vic for the weekend to get something done. I find myself wondering…Am I through with Home Depot? We bought something like $350 worth of stuff last weekend…mostly wire and fixtures, as well as a few pop-in electrical boxes. The three fixtures were for the outside lights at the rear of the house…two matching porch lights and a dusk-till-dawn floodlight fixture. Three fixtures. Four returns. Sigh. Now, please understand, I had no problems with the employees at the Home Depot…they were all courteous and handled my exchanges quickly and efficiently. But…are we really in a world where everything has to be returned at least once to get a product that works? The returns were even more annoying as the store is quite some distance from the Old Vic, and I was ready to hang the lights when I opened them. The dusk-till-dawn fixture was the first. One of its most important features…the photo-cell…was missing from the package. We exchanged it. The new light was in a blister pack and since it took tools to get it open, I knew it had never been opened before. This one had the photo-cell…but one of the sockets didn’t work. I, of course, had to completely assemble and hang it to find that out. Turned out the ceramic was cracked. Sigh. Returned again. Two for two doesn’t inspire confidence in the quality of that fixture…so I decided I’d change my plans and “ponder” a different fixture for that location. AhHa! I have this handy motion-detector light I bought (from Home Depot) early on in the project to replace a bad one that came with the house. I never replaced the bad one, as we eliminated it with the installation of the new stuff. I opened the (previously unopened) box, did the requisite “some assembly required”, and hung the light. Gahhhh! One of its sockets didn’t work. Crud! Foiled again! What, I’m doomed to spend the entire weekend dinking with three light fixtures? Sheesh! I was ready to hit the gun range, toss the thing like a Frisbee and yell “Pull!” but again, exchanged it and it finally works. The culprit? A wire that wasn’t crimped to the socket connector. Next, the porch lights. Securely packed in what appeared to be undamaged boxes. Yet, one had a cracked glass. Once I discovered that I couldn’t even hang the other one, as they need to match and I had to make sure I could get the broken one replaced with another matching one (or I’d have to replace them both). We exchanged that one on the way home, so I didn’t get them hung either. So, of the three fixtures I wanted to hang this weekend…the three I bought last weekend…I got NONE of them done. I did get the substitute fixture hung (the motion detector one) but had to exchange it too. From now on I’ll be opening every package I buy at Home Depot, on the spot, before I leave the store. Are they becoming the Wall mart of home improvement? The quality of their incoming product is either going down, or they are returning defective/damaged merchandise to the shelves (or both). That does not provide a positive customer experience, no matter how courteous your employees are. As an electrician, I’ve hung 50 fixtures in a day. How am I supposed to get anything done if I can’t manage to hang *three* in a weekend? As to getting stuff done…I did finish another circuit up. We now have plugs in the Sunroom and the Master Bedroom! WooHoo! But, oh, I should mention…when we got home to the suburban “blah” house…the 50 watt sodium light that lights up our driveway…the one I bought from Home Depot just months ago, has died. The last one lasted over a decade. This entry was posted in Electrical, Miscellaneous. Bookmark the permalink. 2 Responses to Am I through with Home Depot? Yep they exist in Canada too. However have found the local hardware store is still the best. Problem is those big box stores have just about killed the local hardware store. And the local hardware store has the same problems, everything is made in China and most of the stuff right out of the box is no longer a virgin. Got either a Rona or a Lowes anywhere? Have found too that often the most critical part you need, nobody has, unobtainum comes to mind. in exchange for some slip of paper saying you is what you is, just don’t look too far. 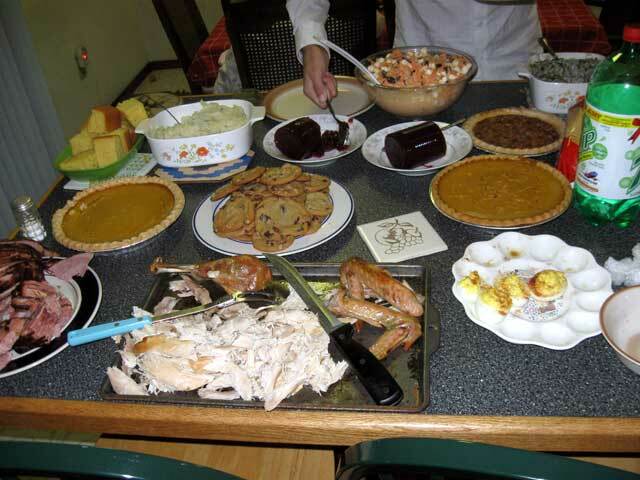 And speaking of looking too far, that spread of food looked delicious. Turkey and ham and my goodness pumpkin pies, lots of real whipped cream too I’d expect. Stuffed eh? Now will the two wheeled monster still hold you and your wife? And where was the four-legged orange monster during all of the festivities? You have a good time, hear me? Snow here in Southern Ontario tonight! Yep, we have Lowes…but they just seem to be Home Depot with a different sign. Our local hardware/lumber stores have very limited selections for things like fixtures. The big-box stores have damaged them. I guess I’m going to have to find a store that specializes in whatever it is beyond the basics that I’m looking for at the time. I want some unobtanium…(loved that movie, in a campy sort of way). For Thanksgiving, he spent his time under the table. Sooo many toes to attack!